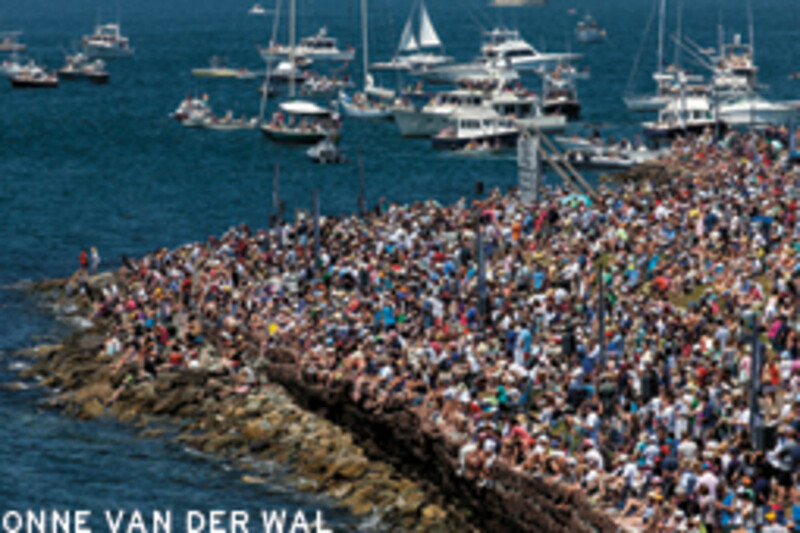 Old salts may find it hard to believe that it had been 29 years since the America’s Cup took over Newport, R.I., but the sailing spectacle drew nearly 60,000 people to the shores of Narragansett Bay earlier this summer. 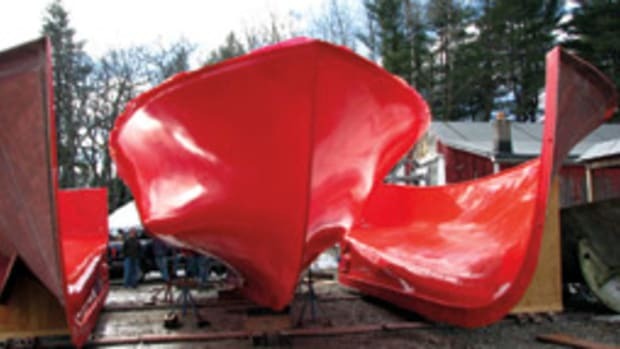 This, however, was not Ted Turner’s America’s Cup. 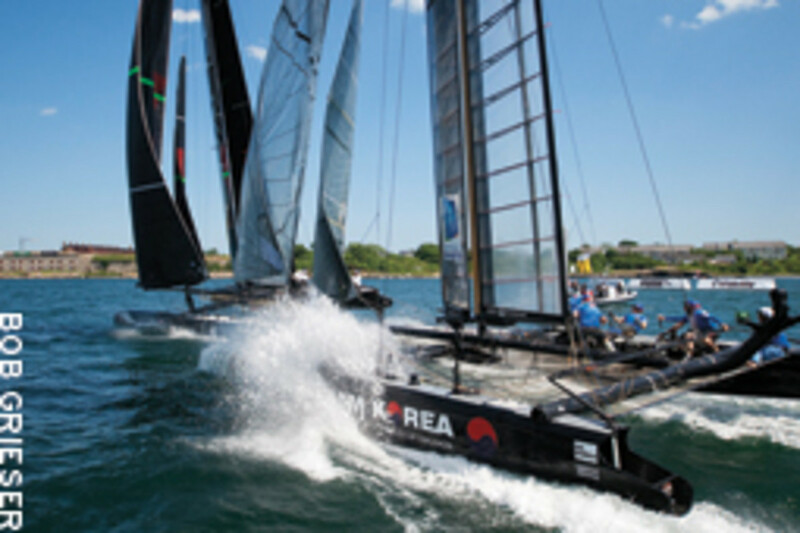 The June 26-July 1 regatta at Fort Adams State Park was the sixth and final stop of the America’s Cup World Series, the international circuit that’s promoting the new Cup catamarans. 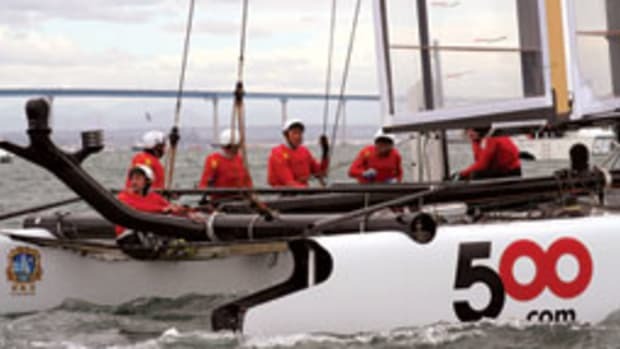 The inaugural 2011-2012 World Series was raced on honeycomb-cored carbon fiber AC45s with fixed wing sails. These 44-foot cats have a beam of 22.6 feet, can sail at double the wind speed — close to 30 knots in moderate air, with their crews of five — and can turn on a dime. You’ll find yourself reaching for something to hold on to if you happen to see one capsize. 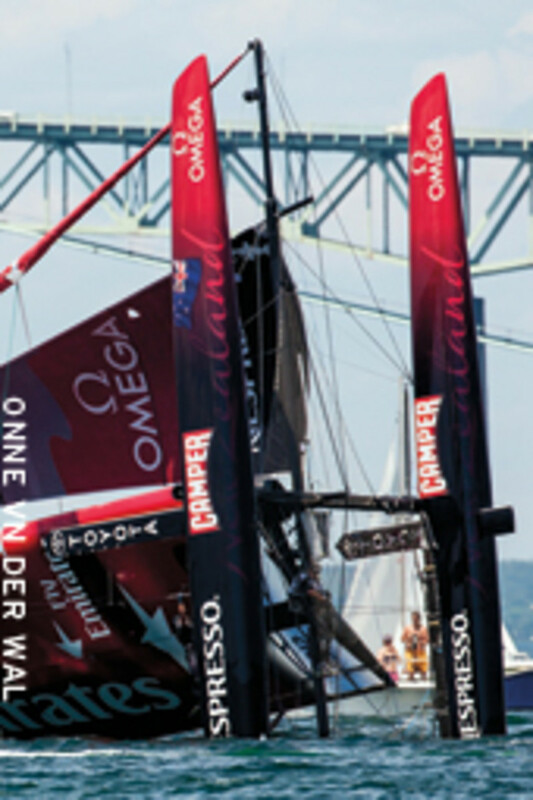 Skipper Jimmy Spithill and U.S.-based Oracle Team USA, backed by software billionaire Larry Ellison, claimed the AC World Series season championship among eight teams from New Zealand, France, Italy, Sweden and Korea. There was both fleet racing, in which all teams sail, and match racing, in which two boats battle head-to-head. 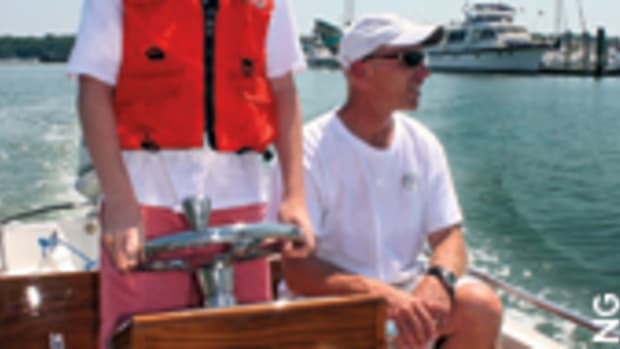 Patrons came to see a show and get close to the action — and they did, with a course designed to take the boats close to shore. What was striking about the Newport event was how open it was. Spectators milled about just feet away from race crews tuning their machines in the wide-open team tents lining the entrance. Brenton Cove was packed with all manner of boats — power and sail, kayaks and small boats — maneuvering the crowded waters and getting close to the AC45s moored about 50 feet out. Music blared from the stereo system of a Red Bull Jeep, and a massive outdoor screen showed clips of the racing and post-race interviews. Spectators taking photos with smart phones were ubiquitous. Despite the commotion, the overall mood was that of a pleasant family event. 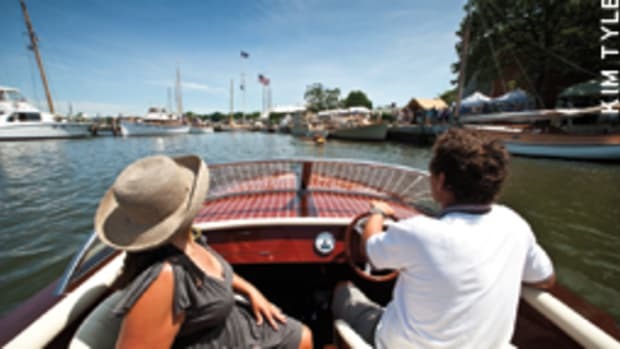 From the high-end watering holes and exclusive Club 45 hospitality tent to the burger joints and nautical Exploration Zone tents, the AC World Series at Fort Adams felt like a festival. 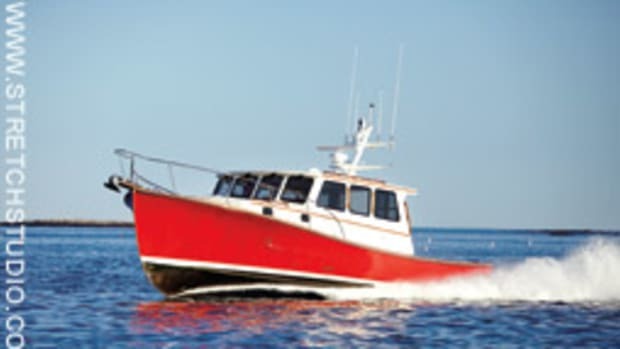 There was a composite catamaran that passers-by could touch and rap with their knuckles. An underwater camera installed in a lobster trap offered glimpses from the bottom. 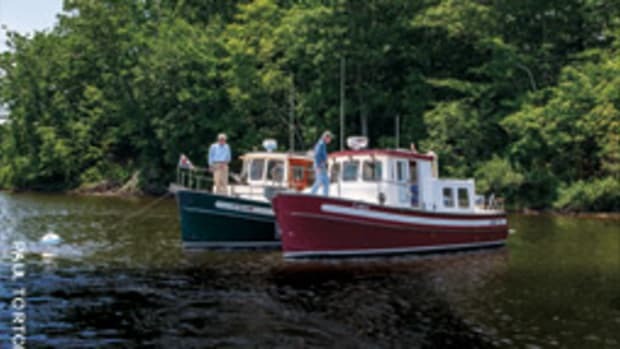 In a nod to tradition, there were antique ship’s wheels and brass engine controls. The two Oracle boats — syndicate CEO Russell Coutts skippered its other AC45 — had the largest fleet of RIBs and other support boats shuttling crewmembers about. The sailors received a spirited round of applause from the patriotic gallery as they boarded a RIB to be ferried out for warm-up runs. As the teams tested the conditions before racing, announcers explained in layman’s terms what the crowd was about to see — what tactics would be used and why — to a gallery presumed to be unfamiliar with the new boats and racing format. 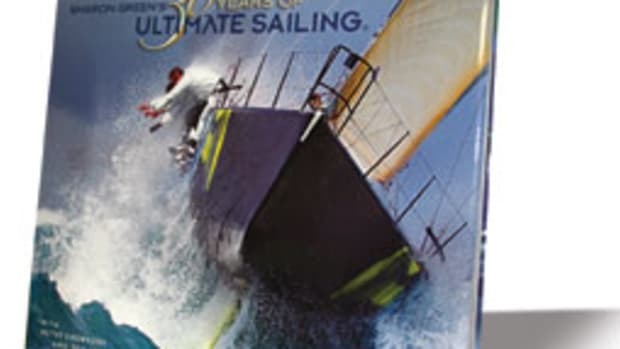 The final day’s racing was broadcast nationally on NBC, the first U.S. network broadcast of America’s Cup sailing in 20 years, and drew an estimated 1 million viewers. 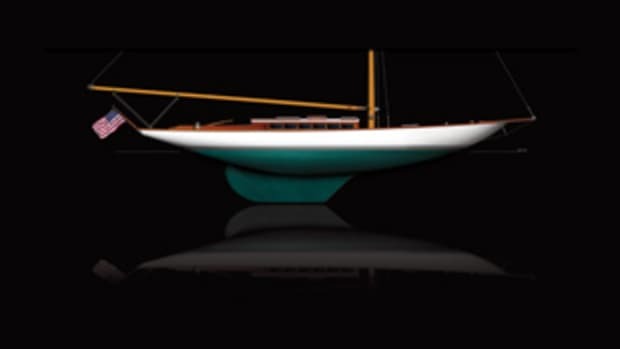 No, this was not Ted Turner’s America’s Cup, and perhaps traditionalists will snub their noses at sailors in crash helmets. But these catamarans provide some of the most exciting sailing you’ll ever witness. The AC World Series second season starts with the Aug. 21-26 regatta in San Francisco. Then bigger, faster AC72s will go at it in the Cup finals in September 2013 on San Francisco Bay (www.americascup.com). Check it out if you get a chance. You just might leave your blue blazer in the hanging locker.